The old adage that “Pioneers get the arrows, settlers get the land” holds unfortunately true throughout history. Until there is an actual time when something happens that Thomas Kuhn would balk at calling a “paradigm shift,” those who push for that new paradigm of understanding are generally harassed, derided, burnt at the stake, or receive some equally rational treatment. This happens throughout the history of the dominant culture of the time, but those who write alternative histories fall generally into the same trap. Combine this with Americans’ essentially adolescent belief that history begins the day one is born and one has a recipe for shocking ignorance about things that change American life forever. However, this does not make history go away. It means only that someone has to recover it. This is essentially the task Jon Marans has set himself in his play, The Temperamentals. 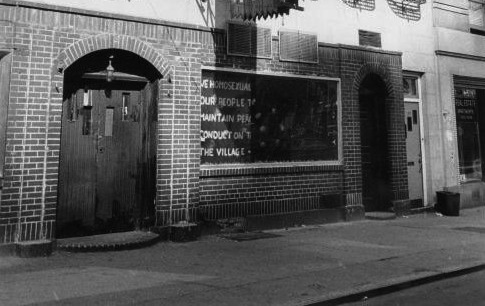 Perhaps inspired by seeing this sign in photographs about Stonewall, Mr. Marans decided to go in search of an answer. In his dig beyond the cliché answers about gay rights, he discovered the story of Harry Hay. Later known as a bit of crank who often seemed to pop up at gay rights rallies just to infuriate people with his anti-assimilation speeches, Harry Hay was truly one of the earliest warriors in the battle for gay rights in America. Like other gay men of his time (such as James Baldwin), Hay joined the Communist Party to fight for the liberation of his people, only to resign from it when homosexuality proved to be unpalatable to the American Communist Party. Mr. Marans includes all this in his play, but his real focus is upon Hay’s founding of the Mattachine Society and, specifically, upon the court case of Dale Jennings, in which the Mattachine Society fought against the policy of police entrapment of homosexuals. What makes the play work so well is the delicate interleaving of the stories. The play has much romance in it but its romance is tempered by grim understanding. The affair between Harry Hay and Rudi Gernreich gives birth to the Mattachine Society. In a sense it gives Hay the strength to leave his wife, as well. But it is inherently doomed, not just because the lovers are homosexual in the United States in the 1950s, but because fundamentally they are different people with different levels of courage and enlightenment. We know how to live through their eyes. We can always play their games, but are we denying ourselves by doing this? If you’re going to carry the skin of conformity over you, you are going to suppress the beautiful prince or princess within you. Hay’s belief that homosexuals are fundamentally different from the “majority” and that they must not assimilate into the mainstream and lose their identity runs exactly counter to his lover’s beliefs. Above all, what Rudi wants is a career and fame. He knows that in this world in which they are trapped, such a love as Harry’s will never be possible. Ultimately, Harry himself sends Rudi away because he must. This constant yet subtle dialogue between assimilation and exceptionalism in the romance also underscores the fundamental issue of how gay men (and women, certainly) should establish their identities within American culture. It is also what drives apart the Mattachine Society itself. One could even say the issue remains unresolved to this day. Similarly, the relationship of gay rights to Communism receives a subtle treatment. Many gays, like many women and African Americans in America in the early half of the Twentieth Century, joined the Communist party because Communism promised that it would free everyone from oppression–including, by implication, minorities and women. As this turned out not to be true, it left these groups wondering exactly what would finally set them free. Mr. Marans interleaves these themes of individual love, collective responsibility and political awareness quite expertly. Where other playwrights are strident, he is quiet and as passion is said to intensify with restraint, so his play grows in strength inverse to its subtlety. His script is quite brilliant. If it has any weakness, it is the ending. Writers often feel when they are dealing with “real life stories” from history that they need to give a run-down on “Where are they now?” This is a cliché of the Hollywood film, and I find it deeply unsatisfying, though certainly I understand the quandary. 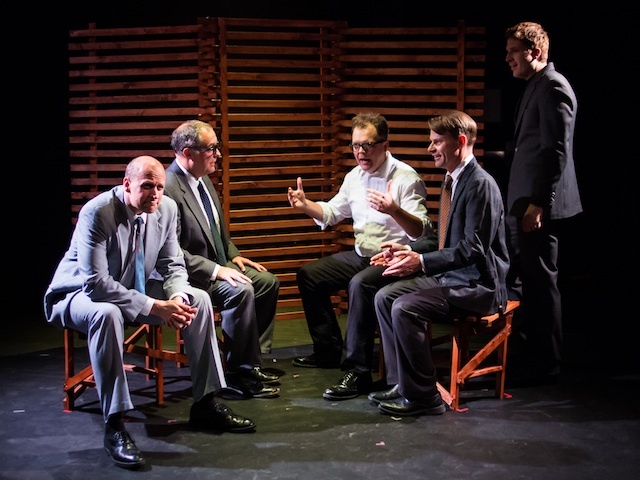 Mr. Marans does not want history to die at the end of the play, and probably wishes to prove that these forgotten men led meaningful lives that should not be forgotten. I question whether the summary is the best way to do so, but this hardly detracts from the rich body of the play before the epilogue. Director Roy Arauz has an impeccable sense of exactly what this play means. He has divided the difficult Ballard Underground space into two halves–very much the way the characters themselves are divided on the issue of assimilation–and used only the most spartan set. This works to the play’s advantage. By stripping away everything unnecessary, he emphasizes the beauty of the text and allows the actors an incredible freedom to engage the script and, at times, the audience directly. It helps, of course, that he has a brilliant cast. Daniel Wood as Harry Hay plays loud, brash, obnoxious, divisive–and simiultaneously tender, romantic, thoughtful. His portrayal absorbs all the contradictions of his character and gives each equal weight. Such a feat is commendable, and shockingly rare. Jaryl Allen Draper shares a lovely chemistry with Mr. Wood that is quite beautiful, making the sense of doom with which he imbues his role even more heartbreaking. Both are supported expertly by Justin Ison, Greg Bee and Will Halsey (and his clarinet). As an ensemble they are remarkably sympathetic to each other, which shows brilliantly in the scene where Harry Hay and Rudi Gernreich are simultaneously trying to recruit Mattachine members in two different stage spaces. The entire cast have grasped the harshness of the play’s environment, but they remember also to play it with humor and verve, making the play even stronger. Kristina Simson’s costumes, too, are very thoughtful. She draws a subtle arrangement of status and character out of the most staid of outfits–a sign of a notable intelligence. Human rights will probably remain an issue as long as there are human beings. Gay rights are obviously topical. 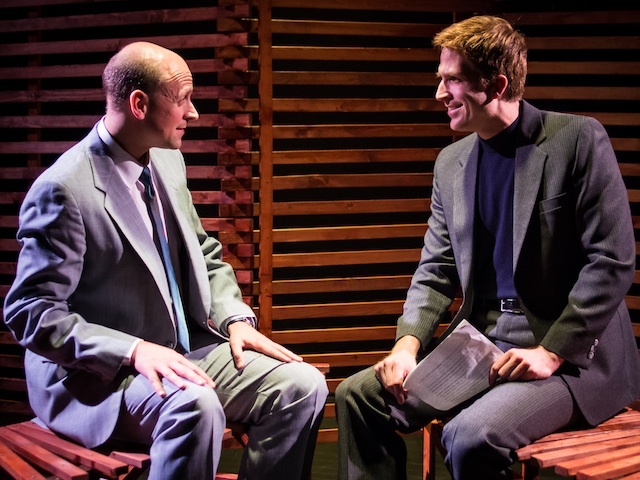 The Temperamentals proves that a well-written history is itself topical. While attention spans get shorter and history becomes even more remote from the quotidian lives of American citizens, it is important to preserve what people already know. But it is also important to recover knowledge that people are in danger of forgetting. Jon Marans has done very well with his play. It deserves a wide success–even wider, if it actually serves to spur audiences to think more deeply and with fewer clichés about its subject. History will always remember settlers, but it just as desperately needs to remember its pioneers.